Yarr. Everyone likes treasures! Anyways, back on topic, TheZappa has started a rather interesting thread about each player's favourite booty. What made the thread worth reading is that many forummers contributed tips on how to get the worthwhile treasures, as well as advice on getting the helpful boosts such as the pirate-guarded 325 gold. Treasures are good boosts to your economy to gain that little edge over your opponent. Go submit your input here now. Yarr. Olannon has posted a thread in our Strategy Central forum asking about the very-likely possibilities of booming or turtling with the Germans. "It's essential, you get to play in every age of the game! "Olannon, what is your point with all of this, will you ever get there? He's opening the field for strategists to see if this can be done. Interested in coming up with a German boom strategy? Can it happen? Check out his thread and discuss! This week we're wondering "What type of download are you most interested in?" Vote in our poll! What noteworthy events occured on the AoE3 battlefield recently? This week started off with a thread asking an simple question: How did you discover the Age series? Next came a cool thread that gives the interpretations of what the units say in their respective languages, still growing of course. If you're curious to see what your Explorer is really saying as he awakens from his minor leg injury, now's your chance to find out. There was no shortage of strategy articles; posted this week was Ceres's Guide to the British, the Dutch Wildcard Strategy, and the Dutch Great Wall (a good week for the Dutch). Bruce Shelley posted up a new designer's blog, and finally, the Fort Wars team has uploaded Fort Wars 1.0. That's it for this week! See you on the battlefield! Age III Reviewer Replies to My Comments on Review Disparity: A few entries ago I mentioned being struck by the disparity in the Age III review scores published by the two leading PC game magazines in the US. I drew particular attention to the score in Computer Gaming World: three stars out of five, which I translated as 60%. Tom Chick wrote that review and was disappointed to read my comments. You can read what he had to say in response here. Anyways, the point is, go check it out now here. The Fort Wars team (Matei, pftq, TBMike and myself) are happy to announce that Fort Wars 1.0, the update to the most played Age3 custom map to date, has been released. This new version contains a long list of changes and additions, and a possible fix to the OOS errors, special powers, bigger civilization based bonuses, and much more. To find out more, visit my forum thread. You can download Fort Wars 1.0 here. As the ToC shows, it's definitely lengthy and detailed, making it a must-read. Check it out! Have your own additions or corrections? Add them to the thread! Diceclock has written an interesting guide for the Dutch. It is indeed not a single strategy, but opting for flexibility and adaptation. It has build orders for Fast Fortress countering, heavy booming, and also for an early attack. Here's a snipit from the thread. To provide a flexible Dutch opening that allows the player to adapt and execute any of the popular Dutch opening stratagies. To provide the bennefits of the best military openings without sacrificing economy. To allow the Dutch to remain in Colonial without having to feel rushed into a premature Fortress. Check it out in this thread! Fortress Age Merc Spam, and my current favourite, the Fast Industrial. There are no step-by-step build orders, just some sound advice and tips and that I have learnt on my own after playing almost 200 games as british. How Did YOU Find the Age Series? king_magician posted a discussion thread in our General Discussions forum asking how you learned about the almighty Age of Empires series. Did you learn about it from a friend or acquaintance? Found the game while browsing the store? Some crazy guy throw the game at you in a wild frenzy to stop the voices? A mix of each? Tell us in our forums! The question this week has to do with the geography of the New World: "What's your favorite random map?" Vote in our poll! It was another active week here at Age of Empires III Heaven, with the week starting off with the announcement of the first 2v2 AoE3H Ladder Tournament at Patagonia, which is going to be held tomorrow for ladder players. Not a part of the ladder? Sign up and start playing! AoE3 got significant praise this week, being the 8th best selling game of 2005, and for beating out all other PC games in sales for the month of December. The highlight of the week was the release of patch 1.04, which fixed a lot of stability errors with ESO2 to improve gaming, but it came with repercussions; some mods, notably Ekanta's UI, were incompatible with the patch and cause OOS errors. Finally, a Cinematic contest hosted by Liquid Fire Studios has started today, with sign-ups ending February 3rd. If you plan on designing for it, enter today! That's all the news for this week. See you on the battlefield! 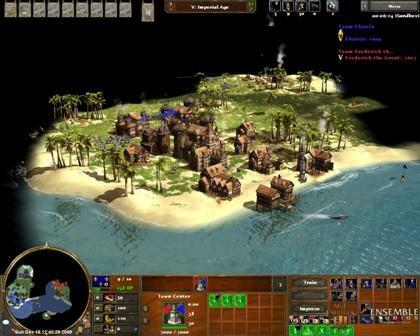 "The Myll Clan has launched a signature ratings solution for AoE3, with many innovative ideas. - Supports both Supremacy and Deathmatch. - Random images for various time periods if the user can't decide on a specific image. Ratings are calculated through a player's wins and losses to obtain an ELO rating (1600 being the default rating). Thanks to plexiq and fast_tam for providing the rating scheme. The Myll Clan is working on a ladder solution to properly determine a player's rating, incorporating the skills and ratings of opponents, as well as team games. The Launch Date will be announced when the project is close to finished." This is a reminder that we're holding another forum party today at 12 noon, EST/5PM GMT and 8PM EST/1AM GMT at the HeavenGames lobby on ESO (which will be created 15 minutes prior to the party times). As with all forum parties, it's a great chance to improve your game, crush Elpea, and learn from fellow players! Liquid Fire Studios has announced that it will host a cinematic contest. It will be based on how well the map design is, the storyline, as well as being original and simply put, awesome. The prizes are very good - the winner gets 1 of 3 excellent games, a T-shirt, and their movie will be publicized in their website. Since this is a larger scaled contest, it needs participants. So quickly sign up and show what you can do! - Your first and last name (private information will not be given out). - Your HG or LFS forum nickname (if you don't have one, make one). You cannot enter the contest if you don't do this! Any designers can participate, but you should hurry as the contest ends in March 25th. This is a good chance for people to take advantage of the graphics of Age of Empires III, and to utilize the trigger effects. Anyhow, check out the thread here. So, sign up before the sign-up ends in February 3rd. ... "4:- Then, all vills to hunts. 5:- Except 1 vill to wood cart, build house, then, shift to hunting. It sounds like he's open to commentary, so be sure to check it out! 10. The Sims 2: Holiday Ed. Thanks to KS for the news! If your Age3 won't start after installing patch 1.04, the problem might be Ekanta's UI. Ekanta's UI, which we talked about here at Age3H a few days ago, has a feature that has been disabled in the new patch and therefore cause the game not to start. In order to play, you must uninstall it. If you have no idea what Ekanta's UI is, then you don't need to worry ;). -Update to the patching process which should address difficulties experienced during the autopatch process. -Resume button added. A dialog is now displayed when a user pauses the game. -Changes to Games List functionality. The list is pulled down once on initial login and can be updated by pressing the Refresh button. -Quickmatch now uses only standard maps. -Home City level now displayed on the Game Start screen. -Clan tags added to the Advanced Game Setup. -Fixed an issue with clan chat not being displayed. -Fixed a game pause issue when a resigned player remained in game. -Removed the exploited ability to split the military and economy scores. -Timeout added to Vote Dialog box. You can download the patch by logging in ESO2. KS informed us in this thread that Ensemble Studio's Age of Empires 3 is the 8th best selling PC game of 2005. On the top 10 list, Age of Empires 3 is the only PC RTS game. In fact, if you do not count simulation games such as The Sims 2 and Roller Coaster Tycoon, Age of Empires 3 is the only high selling strategy game. Some good news to online players: ES has sped up their development of the 1.04 patch to ensure better stability and adding a new server for the increase of players on ESO. The patch should be available by next week, according to ES. This patch will be primarily focused on ESO, and thus would not change the balance just yet. And finally, for those that are dissapointed in the lack of a rating system, ES has started developing it. We have accelerated our patching schedule in order to address ESO server stability, which has been our highest priority since our online population greatly increased after Christmas. We have made several server side fixes that improved ESO performance, and added a new server to help with the increase in traffic. All in all, read the announcement here. jaafit has written a guide on a Dutch strategy intended to surprise the opponent by doing exactly opposite of what opponents would expect. It's a good alternative to the typical Fast Fortress employed by many players. By a combination of surprise and villager harrasements, this strategy can help make the Dutch more effective in the early game. You prevent his vils from doing anything. You harrass him relentlessly. You kill as many vils as you can. Keep him off his gold mine. He will try to escape out his back door so you use your envoy to see when that happens. Keep your hussars on the move looking for his desperate attempt to sneak out. Check it out in this thread. It's going to be a one day, single elimination event at Patagonia. To be held on Sunday, 22 January. Participants must be on the AoE3Heaven Ladder with a minimum of 3 ladder games played. Teams can have a total of no more than 245 ladder points. For all of the rules, signups and even to find a partner go to the Tournament Thread. If you're not already on the Ladder you can signup right now and start playing games immediately. Fame, glory and a whole lot of ladder wins await the champions. This week we're asking about the sub-civs that make Age of Empires III even more fun to play: What's your favorite Native tribe in AoE3? Answer in our poll! This week saw tons of activity in the AoE3 community, starting off with pro Flammifer posting up three articles: a comparison of light infantry, an article about AoE3's scoring system, and last but not least, an article on XP and trading posts. This week also included the opening of the Ask Sandy thread over at the Age Community, where veteran Ensemble developer and overall "1337 guy" Sandy Petersen answers questions regarding AoE3. Next came lead designer DeathShrimp, giving us his balance opinions on the under-powered Portuguese as well as future patch information in our forums, and Bruce Shelley updating his Designer's Blog. Finally, Elpea featured a couple mods today and gave a design community update to show the latest in the Scenario Design world. That's all for this week, see you on the battlefield! This week's Forum Party is happening on a Sunday because I, admit, forgot to newspost it yesterday ^_^. Anyway, this week we have two choices of games. Fort Wars, the popular blood style RMS, or Deathmatch. For more information (such as times and etc), check my forum thread :). Not only the scenario will look amazing, it will also sound amazing. Gaurdian has partnered up with voice actors to do the voice work for his scenario. Not only that, he has compiled a great set of music for the scenario that will amaze you. I have listened to both the voice acting and the soundtrack myself and I can personally tell you it is awesome. Progress on the development is going at a good steady rate. If you wish to view more screenshots, comment or flame Gaurdian- visit his forum thread. Woad Creations Closed Its Doors! Woad Creations is a pretty old Design Team for most strategy games. Projects by this team include the famous Norse Wars map for Age of Mythology. It is must unfortunate to see Woad Creations go, specially after all the contributions this team has made in the past. Please give a warm goodbye at the announcement thread. Ensemble Studios' tech team tells me that a (possible) solution to OOS errors on ESO2 may be simply restarting your game after playing Fort Wars. It seems that the error is caused by Age of Empires III not clearing unit data after playing the map, which then gets carried over to a normal RMS. The error doesn't happen to everyone though, so you're fine if it doesn't affect you. Version 1.0 of Fort Wars is being heavily worked on meanwhile. That is all for this time, see ya later! So if you're bored of your main menu, give this mod a try! (no, it will NOT affect ESO2 or cause any OOS errors). Bruce Shelley has recently updated his blog. While he mentioned some topics outside of Age of Empires III, he also gave some comments to his team's creation. The Dutch Are Coming: I noted a while ago that the Dutch seemed out of favor, which surprised me since they were popular with our balance team during development. We are seeing more interest in the Dutch now as forums discuss the use of Dutch Banks and the Dutch are being used in more games. I think they are one of the better civilizations but also one of the most challenging since their play is really different. For all of our games it has been very interesting to see how the popularity of the various civilizations rise and fall. It looks like the Dutch are swinging back towards being in favor. We’ll see if that lasts or if they fall back. Check out Bruce's blog here. Also, ES_Sandyman has revived the Ask Sandy thread over in ES community forums. Players can ask questions and expect answers. "Fort Blood is a Random Map Script that came with the idea that even though our editor was mostly "bad", even though we couldn't play scenarios online, we still had one hope left - do a multiplayer RMS. But it seems however, that even that is impossible. In the map we use an effect called "Modify Protounit". This effect is made by ES so that we can modify certain aspects of units, like HP, speed, etc. The effect is really a base of our map, because we entrusted that if it worked and it wasn't blocked by ES to work online (like all the triggers in the editor that don't work online) that it would not cause *any* problems with anyone. "Sorry, I didn't mean to be obtuse. We are almost done with the balance patch. I didn't want to say, for example, "in two weeks," because inevitably it will slip until the following week and then everyone will want my head. But it should be soon." We're not considering any Card changes so severe that it would be worth refunding the point you spent on them. We are pretty happy with the balance changes we have in hand. I don't want to spill them out here though because we may want to make a more official announcement. We're still looking at some additional testing and hoping to get in a few ESO changes, but don't think it's going to be April or June before you see the patch. Portuguese - What Should They Change? "I personally think the Portuguese military is fine. They have about the best Musketeers in the game, which is a very mainstream unit. An army of Musketeers and Cacadores is pretty hard to counter and several of the Portuguese cards benefit both units. The British army of Musketeers and Hussars may feel more powerful, but it requires building Barracks and Stables, getting separate upgrades, and keeping them in different control groups (lest you lose the cavalry speed). I'd take the infantry army any day. I think you are seriously underestimating Bandeirantes. It takes a player who can micromanage a lot, but those suckers can kill a lot of stuff on their own, especially with Crackshot. How are you supposed to counter that? If you kill them, the Portuguese player just ressurects *all three* again for the low price of 100 Coin. I do think the Portuguese get off to a slow start and can't capitalize fully on their extra TCs quickly enough. For a long time in the game, the Ports were way too powerful, so we probably erred on the side of making them too weak. I think some kind of econ boost would help them a lot." Check out the full thread in our General Discussions forum! French Cavalry isn't Over Powered?! 5) Are you aware that French cav are OP? A – I deny that French cav are OP. French hussars and dragoons are the same or even weaker than those of other civs. And our balance tests demonstrate that cuirassiers are in fact slightly weaker, per cost, than hussars. To read Sandyman's full post, go to his thread at AgeCommunity. Check out his thread for more information! Essentially the score is the value of what the player currently has. That means resources in the stockpiles as well as the buildings, units and technologies. Every 100 resources make for one point. Units or buildings that are killed or destroyed no longer count towards a player’s score. You may have noticed in the postgame you can chose to view not just the total score but the military and economic scores separately. Check out the complete article! Flammifer wrote an article comparing the various light infantry units in AoE3. He compared units by equal numbers and equal resource costs. The result is rather interesting, as it turned out it was quantity over quality in many cases. In equivalent pop, the higher cost units win except for lbows against skirms and cassadores. In equivalent cost the higher unit count wins. xbows v strelets is a possible exception. Note that the cost of houses was not considered in this test. Check out in this thread. This week's question pokes into the future of AoE3: "What kind of expansion would you like to see?" Vote now in our poll! a RMS by pftq, Elpea, Matei and TBMike. Fort Wars is a blood map that plays very like AoM's Norse Wars. If you love blood maps, then you should not live without trying this out! The entire gameplay involves massing huge armies and killing off your enemies with an array of powerful upgradable troops. Fort Wars is quickly growing as a popular RMS at ESO2. People love it, so you probably will too. More info and screenshots here. Plenty of events in the strategy department happened this week, starting off with F1RE_FLY posting up calculations on how many hits it takes for the three basic Age3 units (Musketeer, Skirmisher, Hussar (or "MSH" for those who enjoy difficult acronyms)) to strike down any other unit. Following it came TheGoodEvil with his The Russian Winter article series, providing several strategies straight from his blog, and adding to the guides came Echoic's guide on a Tower of Power strategy for the Portuguese. Finally, first Ladder champion was announced, the crown going to Qazitory! Congratulations! In addition to the influx of strat news, the developers give us some hints on a release date for 1.04 and their own thoughts regarding patch fixes; they even gave some commentary on future Scenario Editor fixes. Last but not least, TGE started a still-active discussion thread regarding the possibility of trading Home Cities online. That's all the news for this week! See you on the battlefield! If you're a big huge DS fan like myself, you're probably very excited about the Age of Empires: Age of Kings title for the DS. Well, French site jeux-france.com released a fresh batch of new screenies for the title. If you have a DS and are interested, go check it out :). Many think the idea's interesting. Your thoughts? Check out the thread! Tomorrow is Saturday (woohoo!) and Saturday is Forum Part-ay day! If you never came to a forum party, you really should. It's your chance to pwn every forummer and you even get to mock them on the forums. It's also a great chance to learn from great players like TGE and Mokon. For more information such as times and etc, visit my forum thread. The 'Tower of Power' is a Portuguese strategy designed to repel attacks while booming interrupted out of two TCs at home and advancing to age III. It is a turtle and a boom combined. Age II consists of turtling to age III with defense from minutemen and TC fire. Age III consists of finishing the tower (TC-TC-Fort) and creating military units and sending military shipments to counter with superior units and a superior economy. Writing a guide for a turtling strategy is difficult, so bear with me This strategy is a guideline, but as turtling is you will need to adapt. We haven't stated a specific ETA for 1.04, other than sometime in the first few months of the new year. I certainly understand the frustration that players have been experiencing with all of the Otto, French, Otto, Otto, games being played and the instability of ESO. We're our own biggest critics, and no one here finds the current performance of ESO acceptable. It's our number one priority at the moment. We know there are some bugs in the editor and we do plan on fixing them, but it will probably be after patch 1.04. While we recognize that user-created content, including mods, is increasingly becoming more and more important to our types of games, it is easy during development to always push editor bugs down below those that affect say ESO or setup issues. It makes more sense, in our minds, to deal with the editor once we have major stability issues addressed, else you risk having great tools and nobody left to use them. I know some of you would prioritize things differently. With the AoE3Heaven Ladder having just finished it's fourth week there is already quite a bit of activity and we're just getting started. Qazitory is the first ladder champion after having gone undefeated in a round robin tournament between the top five players on the ladder. Congratulate our new champion and check out the downloads section for some great games from the tournament. How long can you keep that crown Qaz? About Ladder Warriors: These players take on all Challenges. They are not afraid to put their points and their egos on the line. Graceful in victory and defeat, they learn from both their wins and their losses. They look at every challenge, no matter how tough their opponent, as an opportunity to improve their game. They just love to get it on. No excuses are given when they lose; they just say.....I'll get you next time. Their attitude is their opponent may have won the battle, but they will win the war if not now....next time. The Ladder Warriors for Dec 23 to Dec 29 are Myll_Erik, HelzBelz and AlphaJae. To read the rules, join and post game results see the ladder thread. To view the current standings see the rankings thread. NIC1138 proposed that by using a certain math calculation, one is able to find the optimal amount of villagers to enhance some strategies. This serves as a useful guideline in which a gamer can perhaps gain that small edge over an opponent. It´s just a sum of the harmonic series [1 + 1/2 + 1/3 + ... + 1/(n-1) ] (this is approximated by the logarithm function) plus a term related to the last saving of food, proportional to the amount of food we want. This last term decreases with the amount of villagers. A very good read indeed, especially for those of you who enjoy playing as the Russians. Check out the thread for more information! It's that time of the year again. What time do you ask? Time to vote! For what you ask? Why, the Age of Empires III Heaven Community Awards! This is the time you take to vote and award those who excel in our community. The most helpful forummer, the best newbie, the funniest forummer, etc. For more information, visit this forum thread. Check out the rest of his results in our Strategy forum! Gamespy has picked out their favorite games of the year for the good ol' 2005. Not surprisingly, Age of Empires III won some awards. Gamespy handed the game a PC Strategy Game of the Year award, as well as the 5th spot as the PC Game of the Year! Congrats Ensemble! :). Update: I seemed to have missed as reader FD2 pointed out, that Age of Empires III also won Best PC Graphics. There were also Reader's Choice award. Age of Empires III came close, but Civilization IV took the first place. This week we're asking you "What's the most important quality in a strategy game?" Vote in our poll! We're close to our one-year anniversary here at Age of Empires III Heaven, and we've progressed through the official announcement of the game to the official release surprisingly quickly. With 2005 ending and 2006 beginning (yay! ), one might wonder: what's in store for AoE3H's future? Shaking my magic 8 ball, I keep getting "No".... To cut to the chase: expect a very likely new design for the site, a full content revamp (including new stuff, we promise), and plenty of contests / tournies. This is just from AoE3H alone, so I can only imagine how much buzz there will be in the entire community. Hope you have a happy new year, folks! ToMyBoY has found a way to make units fly by modifying the proto.xml file. This is a wonderful way to make awesome looking screenshots as well as cool effects in single player scenarios. Since the early days of AOM, designers seemed to be fascinated with perching units up on anything that would support them. Walls, buildings and towers were favorites. Yet the process used up to now, that is creating a small hill using the elevation tool and hiding the hill with a model has severe limitations, and during levels, often when the building that's hiding the hill was destroyed, you were left with an unsightly hill that gave away the illusion. Also in AOE3, since there's no impassable terrains, it is hard to get units to stay put atop their little hill perches.